The motion plastic specialist is helping to save its customers even more time and money with new shipping procedures. With this new system, shipping for Canadian customers is significantly faster and less expensive than in the past. igus, major manufacturer of plastic cable management systems and self-lubricating plastic bearings, has introduced a new, expedited system of shipping directly to its Canadian customer base from igus’ North American Headquarters, located in East Providence, Rhode Island. 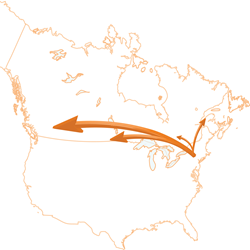 In the past, igus’ Canadian customers would order from their local representatives, who would then order from the Rhode Island warehouse, then ship from the Canadian offices. Now, shipping will come direct from the Rhode Island warehouse to Canadian customers’ offices or homes. With this new system, shipping for Canadian customers is significantly faster and less expensive than in the past. Instead of paying international shipping rates, as well as border clearing and duty fees, the order is processed and shipped directly from Rhode Island, and delivered in 2-5 days, with only a single invoice to process. For example, a 1 lb. box, shipped from Rhode Island to Toronto would have cost $55 in shipping, excluding duty fees. With the new shipping system, this same package can be received for $16.81. For more information about igus’ shipping procedures, or to contact your local Canadian sales representative, please visit http://www.igus.ca, or call 1-800-965-2496.